The distinctive X-A05 automatic from Hogue offers snappy automatic opening action with the push of a button. Utilizing Hogue's state of the art auto technology, the blade rockets into open position and locks firmly in place. A sliding safety adds an extra level of blade security when in the open position. This Allen Elishewitz design includes an ergonomic pocket clip, that is reversible for left or right-hand carry. Highly responsive firing button offers smooth one-handed opening action. 6061-T6 aircraft aluminum handle has a hard anodized black finish with a G-Mascus insert for a secure and comfortable grip. 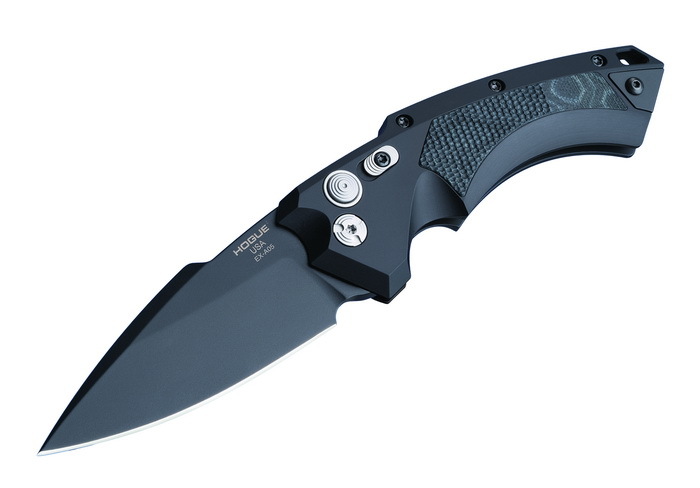 This EX-A05 model is outfitted with a 4" spear point blade in a black Cerakote finish. It has a black aluminum handle with black G-Mascus inlays.